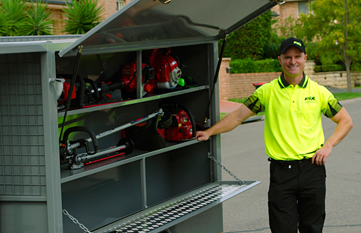 Your local Fox Mowing Specialist in Maroubra, Sydney is David Mitford. Having lived in the eastern suburbs for over 20 years, and working within realestate for 10 years David has a comprehensive knowledge of the local area and knows the value of having a well maintained, and nicely presented property with a great street appeal. David enjoys working outdoors, and loves helping his customers transform their overgrown gardens into bright, open and neat areas that they can spend their time in. In all jobs completed David’s aim is to provide exceptional customer service and work that exceeds all his customers expectations. David provides quality lawn mowing, gardening, hedging, weeding, fertilising, rubbish removal, mulching, cleanup and property maintenance services to his clients in the areas including: Maroubra, Hillsdale, Chifley, Malabar, Little Bay, Phillip Bay, La Perouse, Port Botany, Banksmeadow, Botany, Botany Bay, Daceyville, Pagewood, Coogee, South Coogee, Bronte, Tamarama, Bondi, Clovelly, Waverley, Woollahra, Darlinghurst, Double Bay, Rose Bay, North Bondi, Dover Heights, Vaucluse, Watsons Bay, Kensington, Randwick, Mascot, Eastlakes, Rosebery, Zetland, Tempe, St Peters, Erskineville, Enmore, Marrickville, Wolli Creek, Surry Hills, Redfern, Kyeemagh, Brighton-Le-Sands, Banksia, Arncliffe, Rockdale, Kogarah, Bardwell Valley, Turrella and surrounding suburbs. As a family man David enjoys spending time with his children, travelling, exploring nature and pursuing his hobby of photography. At Fox Mowing & Gardening we are all fully trained, insured and police check approved for your peace of mind so you know that you, your family and your property are safe at all times.We guarantee our service is of the highest quality and conforms to the standards of industry best practices, whilst providing the reliability and professionalism our clients seek for all their gardening and property maintenance needs. With Fox you know that you and your property are in safe hands.